Thank you, we will reply shortly. AppExchange plug-in to make your CRM GDPR compliant. For those who require more robust Salesforce system integrations. For more robust integrations on CRM systems outside of Salesforce. Basic Mail offers GDPR fail-safe emailing with 3rd party services. 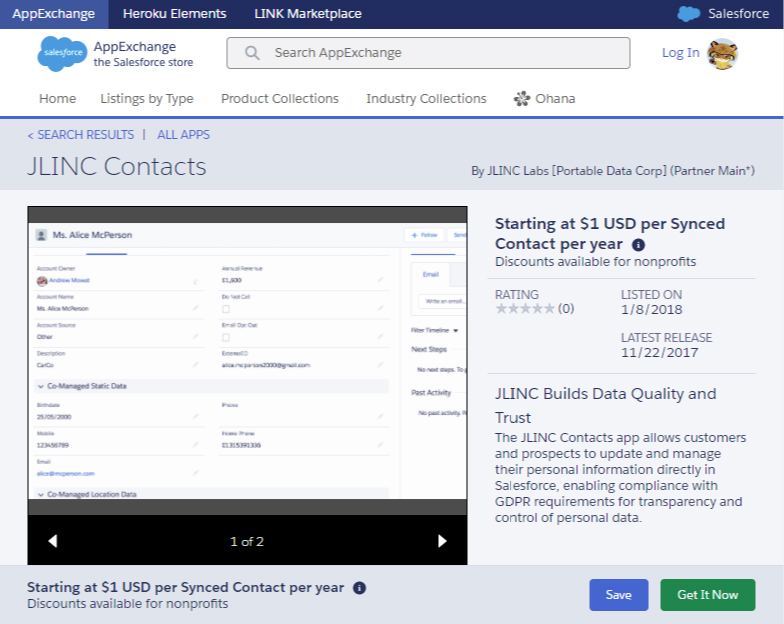 The JLINC Contacts app allows customers and prospects to update and manage their personal information directly in Salesforce, enabling compliance with GDPR requirements for transparency and control of personal data. Each data transaction is completed under a Standard Information Sharing Agreement visible to both parties.Each data exchange event generates a signed data transaction record, with a receipt and audit trail visible to both parties.JLINC can be accessed via a white label portal, or integrated into an existing client portal by API, or soon using the JLINC ‘control your data’ mobile app. JLINC will implement the upcoming Salesforce Individual Object to enable solutions to additional GDPR requirements, e.g. Data Portability, Erasure, Do Not Track. A Salesforce pilot enables the client to engage with JLINC capabilities in their own sandbox environment. A standard 8 week engagement with pre-defined scope, phasing and deliverables, concludes with an impact study and costed business case for wider deployment of JLINC within the organisation. JLINC's proven team of experts have helped to build systems for KPMG, EY, Dolby, Atlassian, Nestle, Mozilla and many others. We will work with you to custom fit our capabilities into your existing technology environment and process flows, while providing the know how to minimize any disruption to your customers and internal resources.